If you read my post on Wednesday you know I’m at Christ Episcopal Church attending the first “Beatles Mass”! I’m in my glory surrounded by the music and magic of this day. We are so blessed to have a church that promotes music of all kinds for the inspiration of all attending. 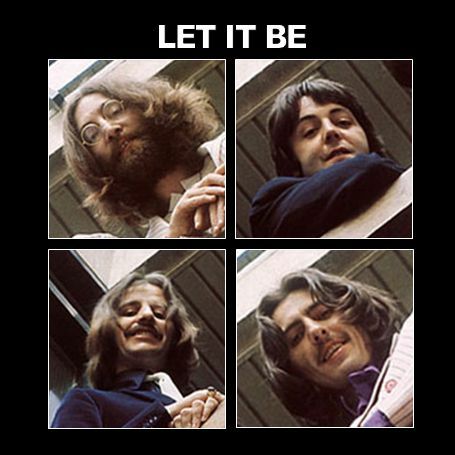 In keeping with the event I am sharing one of my favorite Beatles songs…”Let It Be”. I love the message of this song since it hearkens to what I try to do in my own life…let go and let God. I spent years pushing and trying to make things happen, NO MORE! And the answers DO come so easily when one let’s things be. I’m sharing one of my favorite weekend menus with you today. This is perfect to serve while watching college football or for a casual Sunday dinner. Just a bit spicy but oh so yummy! I think you’ll love it! garnish with chopped scallions and the cheeses. Serves 6. Mash the avocado and add remaining ingredients. Sprinkle with chopped, fresh cilantro and serve with your favorite blue tortilla chips. Sprinkle gelatin over 1/2 cup cold water in a measuring cup ; let soften about five minutes. Separate eggs, placing two whites (refrigerate remaining whites) in small bowl of electric mixer, and place the yolks in the top of a double boiler. Let egg whites warm to room temperature. Beat egg yolks slightly with wooden spoon. Stir in gelatin mixture, chocolate and 2 tablespoons sugar. Cook over hot, not boiling, water, stirring until chocolate is melted and gelatin is dissolved – about 10 minutes. Remove from heat. Stir in coffee flavored liqueur. Turn chocolate mixture into a medium bowl, place in large bowl of ice water. Stir occasionally until cool and consistency of unbeaten egg white – about 15 minutes. Toast almonds: In skillet, melt butter. Add almonds; stir over medium heat just until golden brown. Cool. In a chilled bowl, whip cream until stiff; refrigerate. Meanwhile, with electric beater, beat egg whites just until soft peaks form when beater is slowly raised. Gradually beat in remaining 2 tablespoons sugar, beating until stiff peaks form when beater is raised. With rubber spatula or wooden spoon, fold the egg whites and 1 cup whipped cream into the chocolate mixture. (Save the remaining whipped cream to garnish the finished pie.) Turn the mixture into the shell, spreading evenly. Refrigerate until the pis is firm – 3 hours or overnight. Before serving chop almonds, spoon whipped cream around the edge of the pie and sprinkle with almonds. Keep refrigerated until ready to serve. Makes 12 servings. Being a bonafide child of the 60’s gave me a huge appreciation for music that I still love. At any given time you might find me listening The Doors “Hello I Love You” or Led Zeppelin’s “Whole Lotta Love” full blast in my office here at home or in my car. But it must be said that my never ending favorite group has to be The Beatles. Yes, I saw them as they first appeared on The Ed Sullivan Show that Sunday evening so long ago. I’m not sure I understood it all but I knew I loved the beat, even though I was a bit too young to join the screaming throngs of hysterical young woman practically tearing their hair out over the Fab Four. I think my favorite phase of this brilliant group’s career was when they began to explore what life is all about. They traveled to India, and sat at the feet of Maharishi Mahesh Yogi, the famous guru, who taught them the basis of his teaching, and, by the way, the basis of what Christ followers know as well…Love Is All There is. This message is at the foundation of everything authentic and real. Nobody put the power of love into music in the way The Beatles did. Many of you watched the historic wedding of Prince Harry and Meghan Markle a few months back. The Rev. Michael Curry, presiding bishop of the Episcopal Church here in the USA, gave a powerful sermon based on love and how it can change the world. The whole world watched as Rev. Curry delivered words of hope and stated, “if it’s not about love, it’s not about God.” It’s a timely message for the complicated world we find ourselves in today. I am blessed to have a church community here, Christ Episcopal Church, in Covington, Louisiana. I made the decision to write this post today in light of the fact that our amazing Rector, Fr. William Miller, is offering something so unique for all to attend this coming Sunday, September 23 at both the 9 and 11:30 am services. I will be in music heaven as we enjoy a Beatles Mass featuring all of my favorites from”All You Need Is Love”, to “Hey Jude”, “Let It Be” and many more. Local musicians will play and share the tunes and lyrics that so many of us grew up with. I am sure Fr. Bill will offer words of inspiration and wisdom as the sanctuary fills with joy and happiness! This is a church community that walks its talk so, if you are nearby, or even far away, and you can make it to one of the services you will be very glad you did! Just imagine all the love filling each heart this coming Sunday morning and spreading out into the world! This promises to be a phenomenal day for all! And now that I’ve got your attention on the Beatles…here’s a video to brighten your day! In Praise of Sweet Potatoes! I’m sharing a recipe today that is always a huge hit AND it’s gluten free! 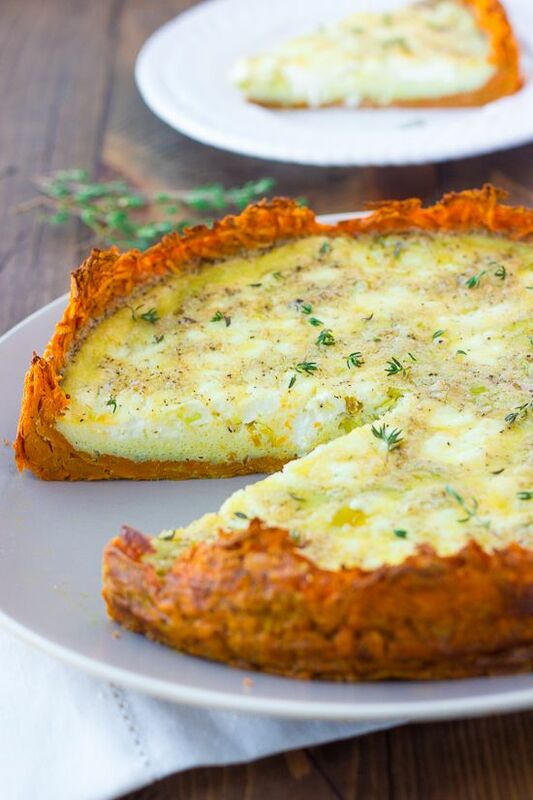 This recipe is for a quiche with a shredded sweet potato crust instead of the traditional crust made with flour. I served this delicious dish at a brunch I catered months back. It went so quickly I didn’t get a chance to photograph it so I am sharing a photo I found on Pinterest that is as close as I can come to what I created. I have a “return to blogging” goal that is all about remembering ALWAYS to take photographs. The recipe is all mine and I think you’ll love it! Combine the ingredients and pat them into a glass pie dish or spring form pan that has been lightly greased. Bake at 425 degrees for 30 minutes. Reduce the heat in the oven to 350 degrees. Place the shredded cheese in the prepared crust. Beat the eggs then add the half ‘n’ half and seasoning. Place the pan on a baking dish to prevent spilling. Bake for 45 minutes at 350 degrees or until a knife, inserted in the middle of the quiche, comes out clean. I know you probably wonder what the rest of the menu was so I’ll share that as well! Creme Brulee French Toast, Creole Mustard Ham and Hashbrowns with the Cajun Trinity. Bloody Mary’s and Mimosa’s were flowing and it was a wonderful time. Enjoy! I featured a post on the parishes of Louisiana shortly after we moved to Lousiana. As mentioned in the post parishes are what most states term “counties”. In researching I was particularly interested in the parish where we live, St. Tammany. Since all of the parishes I have read about are named after bonafide Christian saints, recognized by the Roman Catholic Church, I questioned the name never having heard of a saint with that name. What I found was very interesting. St. Tammany parish is named after Chief Tamanend. He lived in what is now known as the Philadelphia area and was chief of the Lenni-Lenape nation. He and other leaders of this group met with other leaders of the new Pennsylvania colony in the early 1680’s. 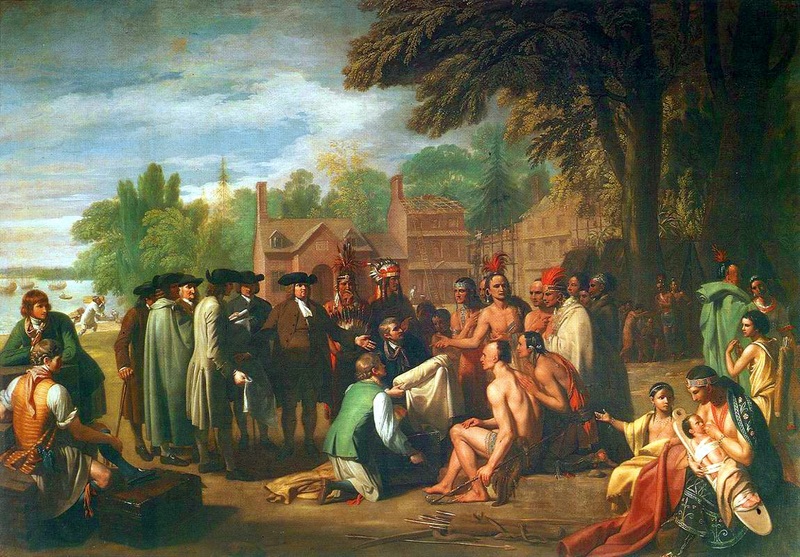 William Penn and Chief Tamanend signed several agreements to protect both of their groups and insure peaceful coexistence. The chief is known for having said the settlers and his people would “live in peace as long as the waters run in the rivers and creeks and as long as the stars and moon endure.” These words can be found on the statue of Tamanend that still stands in Philadelphia. The chief became a folk legend after his death in 1701. He became known as “King Tammany”, “Saint Tammany”, and the “Patron Saint of America”. Tammany societies and festivals sprang up all over the area and spread throughout the land. Today this man of peace continues to be celebrated. I don’t think he ever traveled to the parish that bears his name, in fact, I am sure he didn’t. But I like to think that our area bears the name of a man so important to the beginning of our nation’s history. A man of peace and a place of peace….it just seems right. Leo Delibes composted “The Flower Duet” from his work Lakme. It is one of my favorites! Raised in the world of opera by my mom, a beautiful soprano and performer, I have definite likes and dislikes when it comes to opera. 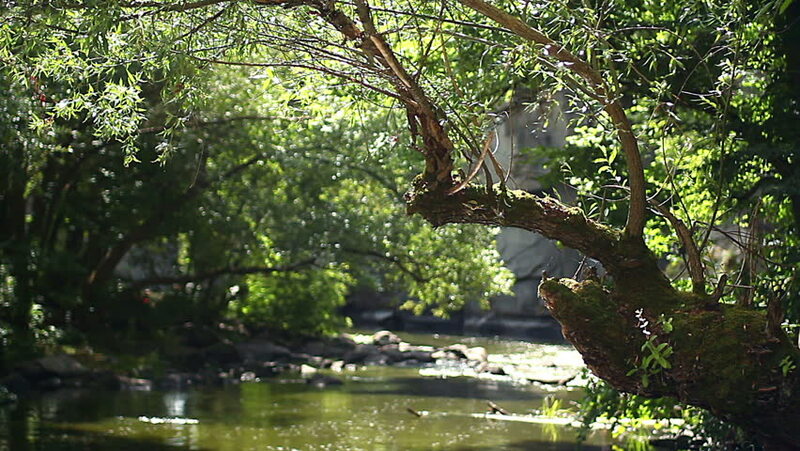 The flowing beauty of this piece always takes me to a place of inner peace. I hope you’ll enjoy it as well as you begin a peaceful Sunday! There is so much beauty to enjoy as the seasons change. I’m searching for my favorite comfort food recipes and getting ready for a power packed week of scheduling and taping shows for The Permanent Tourist podcasts. Life is good here in beautiful Louisiana! This is one of my favorite warm weather menus. I think you’ll enjoy it! Pair this with a good, crisp white wine and you have a delicious meal! Have a safe weekend and enjoy! This recipe serves 4. It can easily be increase to serve 8 by doubling the ingredients. Heat oven to 350 degrees. In a heavy, heat resistant pan (I used a cast iron skillet), heat the oil until it is sizzling. Lightly salt and pepper both sides of each filet. Place the filets, skin side down in the hot pan and sear for about 3 -5 minutes. In a medium bowl, mix the miso, Mirin, ginger root and soy sauce. Spoon this mixture over the top of each filet and put the pan in the preheated oven for 15 minutes. The salmon continues to cook even after you remove it from the oven and it is best if left a bit rare in the middle. 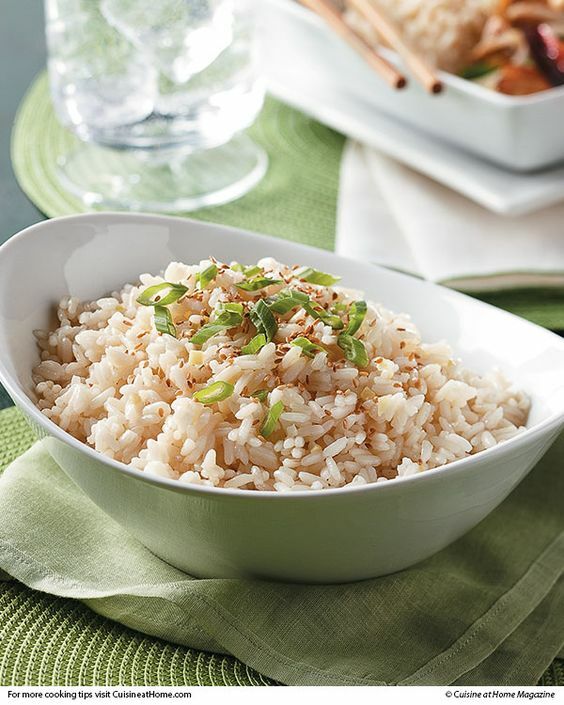 Serve with Jasmine rice (see recipe below) and a crisp, sauteed vegetable mixture (recipe below). Bring the water to a boil and add the rice. Cook 20 minutes, or until tender. Remove the rice to a bowl and toss with the remaining ingredients. For serving I always like to use a large, professional ice cream scoop to put a nice mound of rice on each plate before placing the salmon next to it. Additional chives, uncut, can be used for garnish. You read that right….sauteed cucumbers. They are simply delicious and a perfect accompaniment to this meal. I love to add shaved fennel to this dish and lovely grape tomatoes. A bit of fresh dill and all you’ll say is yum! Note: if you are not a fennel lover, that ingredient may be omitted. 1 fennel bulb, top removed and the bulb thinly shaved, with a mandoline, preferably. Heat the olive oil in a saute pan. 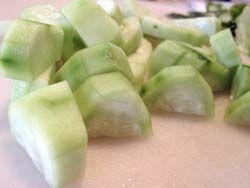 Add the cucumbers and fennel, tossing to heat through yet, still crisp, approximately 5 minutes. Add the tomatoes and toss over the heat briefly. Remove the pan from the heat and season with the salt, pepper and dill. 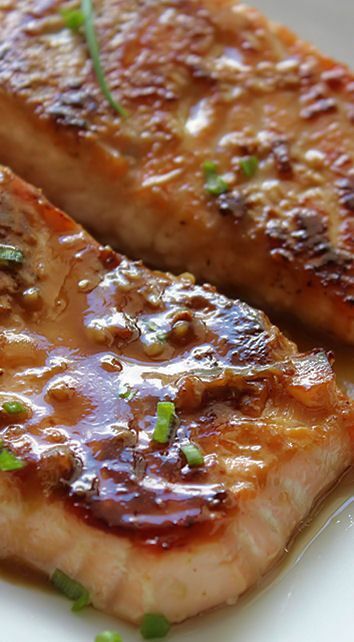 Serve with the salmon and jasmine rice for a delicious combination of tastes and textures. I have to confess that I am a Ben & Jerry’s addict. I control this addiction by not buying it too often, but for special occasions, I indulge myself and my guests in the fabulous flavors of their line. For this dessert I choose their plain vanilla although I am a closet “Late Night Snack” and “Chubby Hubby” junkie. Two pints will provide two nice scoops for four. Place the two scoops in a bowl or serving piece of your choice. Top with crumbled, candied ginger, a teaspoon or so per serving, sliced, toasted almonds and drizzle with caramel sauce. There is a caramel sauce that I can almost faint over: King’s Cupboard’s Three Chili Caramel Sauce. Beware! It does pack a bit of a “heated zing”, but I love the flavor sensation it creates when topping this recipe. My life in Louisiana is finally taking off. All of the equipment for the podcast & YouTube channel is arriving. It’s like Christmas morning unpacking cameras, mixers, microphones and more! This is a dream come true for me as the team puts together shows featuring the amazing food and culture of this beautiful state! Stay tuned for announcements and exciting news. In the meantime read a bit about the history of food in the state. I have to practice the small amounts of delicious things rule in order to stay in shape! One visit here and you’ll know why. I never realized what an impact so many different groups of settlers had on the food we enjoy today. Originally the French, then Spaniards, Germans, Acadians, African Americans, Italians and those who settled here from the Caribbean. Each of these groups of people brought their country’s cuisine with them and integrated it into what has become one of the most extensive offerings of culinary delights of any state in this country. The late chef, Anthony Bourdain, once stated that New Orleans has the best cuisine of any place he ever visiting in the entire world. I agree whole heartedly! African slaves brought their native dish GOMBO. Originally Gombo was an okra stew. Meat and seafood were added as years passed until the dish became what we know as Gumbo. Okra is a staple in Louisiana cuisine. It’s many health benefits are coming to the fore making me want it even more. 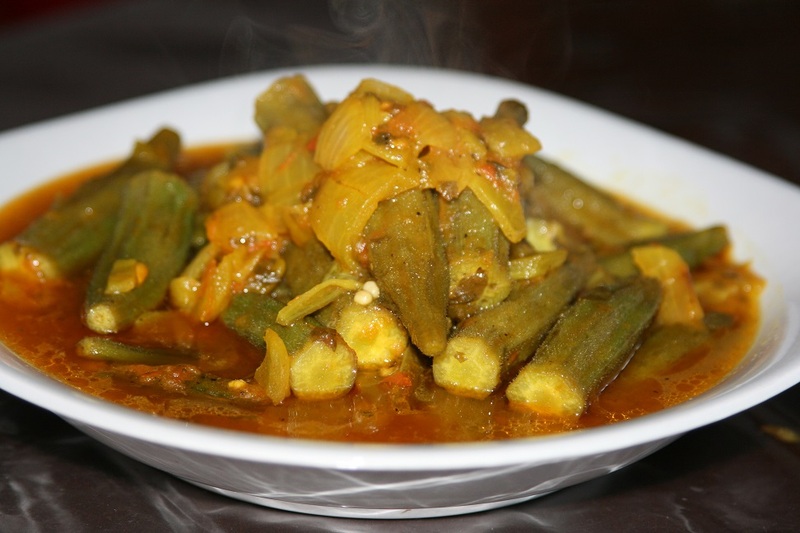 Fried, stewed with creole tomato and sweet onion….there are so many delicious ways to prepare okra! Italian immigrants introduced their “red gravy” to the New Orleans area creating quite an impact on the already established Creole cuisine. In fact, the difference between Creole and Cajun cooking is tomato. You won’t find tomato in authentic Cajun cooking yet Creole dishes use it in many sauces and other dishes. One of my favorite times of year here is when Creole tomatoes are in season. Big, juicy fruit that smells and tastes so exquisite. There’s nothing quite like a good Creole tomato. The whole state of Louisiana has various specialties introduced by settlers. Germans brought dairy farming and sausage making while Acadians shared their delicious one pot meals. 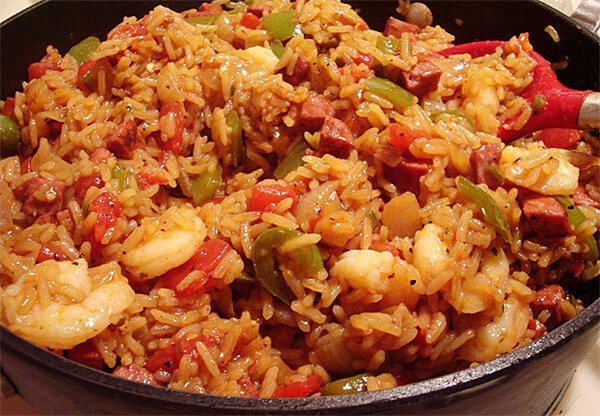 Jambalaya is actually what the Spanish would call Paella. Of course each of these dishes has evolved and the flavors updated as various cooks have had their way with recipes passed down through families. A visit to Louisiana is a must! 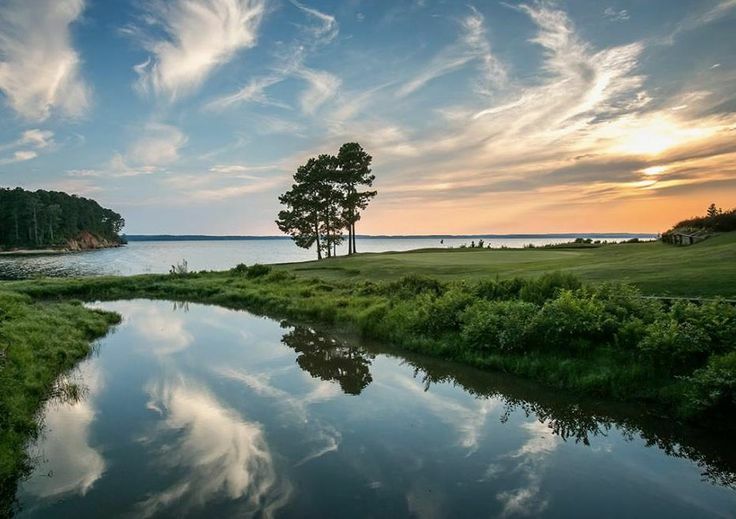 Not only is the state beautiful but the food is unforgettable! We really do let the good times roll here. So do come visit and don’t forget your dancing shoes! 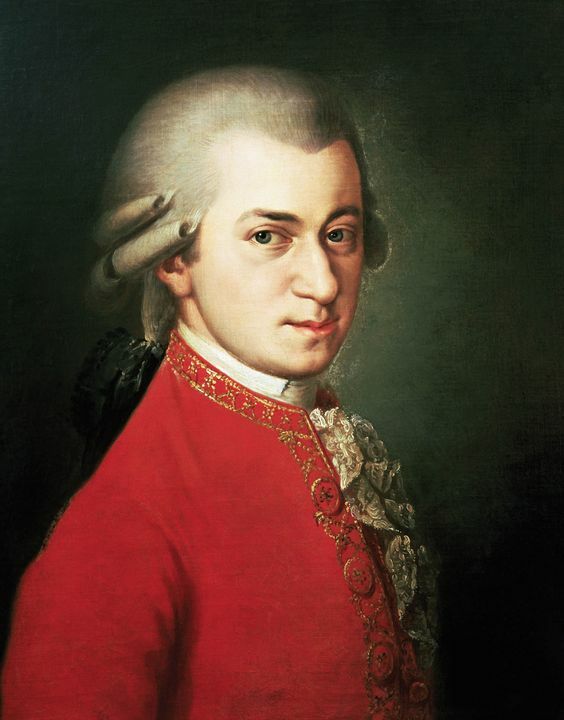 Time for another one of my favorite musical pieces. Today I’m sharing Dvorak’s “Going Home”. I have many fond memories of growing up in Texas, fishing with my dad and dangling my feet in the cool water of a river. Enjoy this day and the music of life! Peace.